OHSAS stands for Occupational Health and Safety Assessment Series. OHSAS 18001:2007 is the International Occupational Health and Safety Management Standard. It defines a set of occupational health and safety (OH&S) management requirements for occupational health and safety management systems (OHSMS). The standard is applicable to any organisation that wishes to eliminate or minimize risk to employees and other stakeholders who may be exposed to OH&S risks associated with its activities. 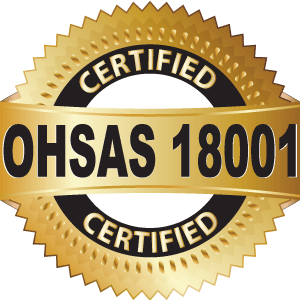 The purpose of OHSAS 18001 is to help organizations to manage and control their occupational health and safety risks and to improve their occupational health and safety performance. No enterprise body can be long term successful, if it does not care about it is employees, their health and safety at work, complying work environment and work conditions. By taking care of the OH&S, organization reduces the possibility of work accidents and their adverse economic and human impacts, on the other hand, creates the conditions for higher involvement of employees, which is reflected in higher productivity and quality of work. Hazard identification, risk assessment and determining controls. Resources, roles, responsibility, accountability and authority. Performance measuring, monitoring and improvement. Improved corporate image and credibility among stake holders, regulators, customers, prospective clients and the public. Adoption of international best practice in relation to risk management. Ensures health and well-being of employees, sub-contractors and the public. Minimisation of liability of employers through adoption of proactive rather than reactive controls. Ensures legislative awareness and compliance. Reduces accident and incident rates by reducing and elimination workplace hazards. Improves the incident investigation process. Increases employee motivation through the provision of a safer workplace and participation process. Our Team offers a variety of Consulting Services and Solutions. We understand that each organization or person is unique. Our Solutions are comprehensive and will be customized to meet your specific needs. Provides well-planned and stage by stage audit program. A sound, coherent and non disruptive assessment. We have an enviable record of customer satisfaction. IQMS helped many companies for the implementation of OHSAS Occupational Health & Safety. We have a proven implementation strategy and process to help & ensure you succeed. Liaison with the registrar, reassessments and follow-up evaluations, and consulting during the registration process.